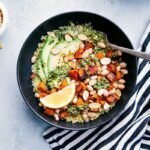 Pesto couscous topped with roasted sweet potatoes, white beans, almonds, and avocado. Delicious and made with better-for-you ingredients! I’m excited to be partnering with Swanson as a blog ambassador this year to bring you delicious recipes like these pesto couscous bowls! Last month I conducted a survey on Instagram asking my readers what they wanted to see more of on my site, and was amazed at how many of you asked for more veggie-rich meals I was excited to get that feedback because I LOVE cooking with veggies as the bulk of a meal. Today I’m unveiling a couscous dish which is packed with veggies and so flavorful and filling! And for you meat lovers out there, don’t despair! This meal pairs perfectly with grilled chicken or pan-seared salmon. These pesto couscous bowls are packed with good-for-you ingredients and tons of nutrients. One of the reasons this dish is so flavorful is that the couscous is cooked in Swanson Organic Bone Broth. Swanson Bone Broth is made from slow-simmered organic bones from chickens that were raised without antibiotics. The bone broth is 100% natural without any MSG, artificial colors, flavors, or preservatives. It’s also gluten free! By cooking the couscous in the bone broth we’re adding a really great flavor base. Once the couscous is fully cooked, you’ll add in some pesto + lemon juice, then the base of these bowls is done! 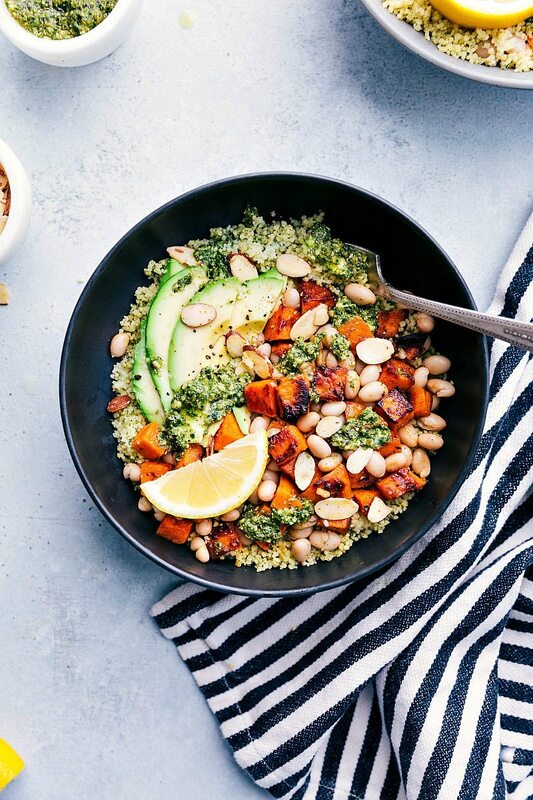 These pesto couscous bowls are topped with roasted sweet potato, white beans, and some honey-roasted almonds. I cut the sweet potatoes into pretty small chunks so they can be roasted in about 20 minutes. Once the sweet potatoes are done, toss the chunks with the rinsed and drained white beans. I also add a bit of fresh lemon to this mixture. If you’re a fan of lemon flavor (like me!) look for Meyer lemons, which make this dish just that much more flavorful! At this point you’re done with all the prep work. A fairly quick & easy meal that is also flavorful and good for you? Win, win, WIN! 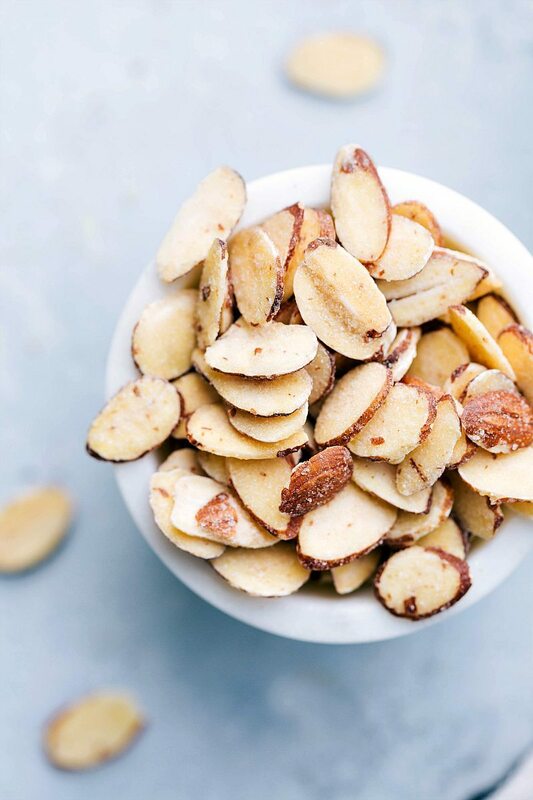 Finish the bowls off with sliced almonds (I use a bag of store-bought honey roasted almonds), some ripe avocado (chopped or sliced), a wedge of fresh lemon, and a few more spoonfuls of pesto and you’re ready to eat! Since the pesto is a big part of this dish, you’ll want to make sure you get a really delicious pesto. 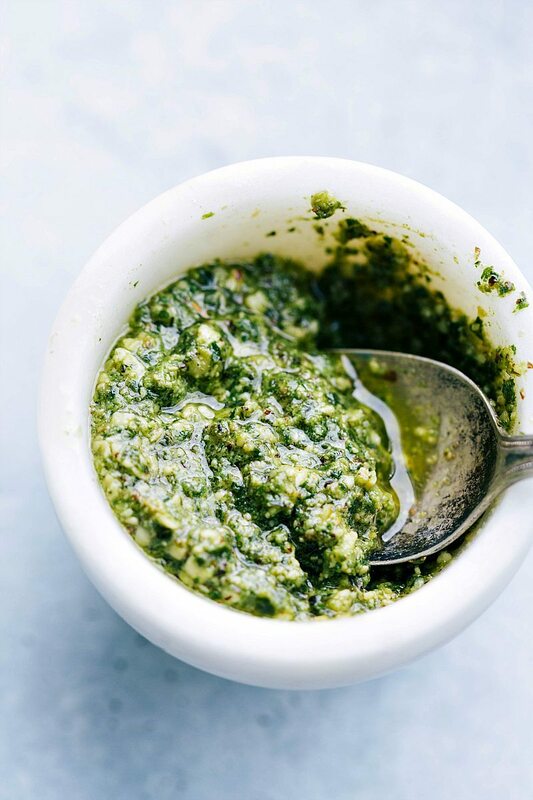 You can of course make your own, but if you’re looking to save some time I’d recommend grabbing a refrigerated, freshly-made pesto which you can typically find near refrigerated fresh pastas and gourmet cheeses. 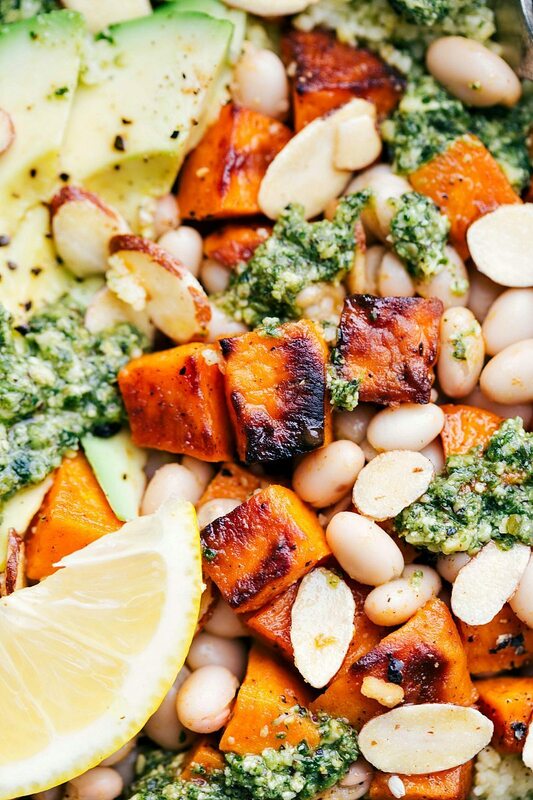 Pesto couscous topped with roasted sweet potatoes, white beans, almonds, and avocado. Preheat the oven to 425 degrees F. Peel and chop the sweet potatoes into small, bite-sized pieces (see pictures). Place on a sheet pan and toss with the olive oil, garlic powder, paprika, and salt + pepper (to taste). Toss ingredients together and place in the oven. Roast for 10 minutes, remove and stir around, and return to the oven for another 7-10 minutes or until crisp tender (timing will depend on the size of the potatoes; I chop mine pretty small). Remove the sweet potato tray from the oven and add the white beans directly on to the tray, and toss together to warm the beans through. Add 2 tablespoons freshly squeezed lemon juice and a bit more salt and pepper (I add about 1 teaspoon salt and 1/2 teaspoon pepper, but add to personal preference) and toss again. Set aside. Meanwhile, add the bone broth to a small pot. Add in the butter and bring to a boil. Once boiling, remove from heat. Stir in the couscous and cover the pot with a lid. After about 5 minutes the liquid should be absorbed. Fluff with a fork. Stir in 1/4 cup pesto, 1 tablespoon lemon juice, and about 1/2 teaspoon each of salt and pepper (again to personal preference on salt and pepper). Assemble the bowls: fill up 4 bowls with even amounts of the pesto couscous. On top add the roasted sweet potato and bean mixture. Add fresh avocado to each bowl and top with even amounts of the almonds. 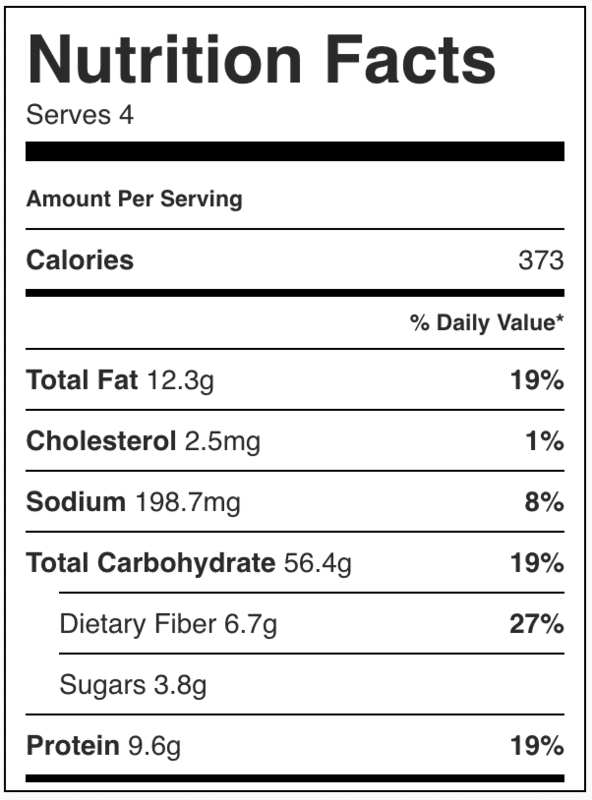 If desired add a wedge of lemon to each bowl. Spoon the remaining 1/4 cup pesto evenly over the bowls (obviously you can use more or less to taste preference :)) Enjoy immediately. I buy pre-made honey roasted sliced almonds that are "ready for salads"
This is a fantastic and versatile recipe! It tastes great and what a yummy way to use pesto. I didn’t have couscous so I used tri-quinoa and used dark red kidney beans in place of white beans. Added some sun dried tomatoes, and it was delicious!!! How long does this last in the refrigerator? I just made it and it’s absolutely delicious! I would like to try to meal prep with it.